Girls hardwork pays off as they lift the Linda Galloway cup for the very first time! 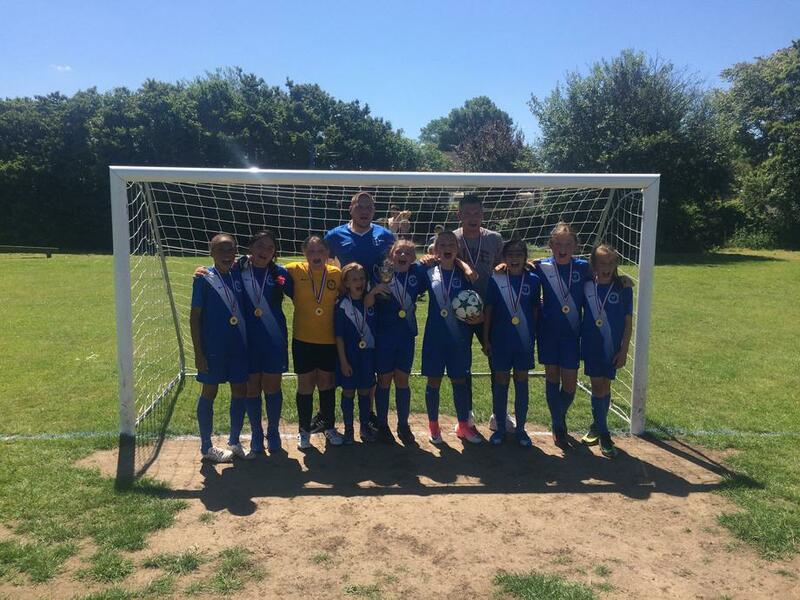 Clockhouse girls football team gave up their Saturday morning to take part in the annual Linda Galloway Girls Football Tournament. Linda was a teacher in the borough who was dedicated to putting girls football on the map before she sadly passed away. Clockhouse started a little sluggish, which is more than understandable when half the squad only got back from the Bournemouth residential trip 14 hours previously. Despite the start Clockhouse looked the better side in their opening game against defending champions St Mary's, with the Year 5 girls Sophie L, Rameen S and Beth C really stepping up to the plate. Sadly, a lack of shots resulted in a 0-0 draw. To advance in the competition Clockhouse now had to beat a very strong St Peter's team. From the start of the game Clockhouse meant business and a deflected Gracie H shot gave Clockhouse the lead. St Peter's worked hard to get back into the game but an unsaveable Sophie L shot doubled the Clockhouse advantage. Clockhouse won the game 2-0 and advanced to the semi-final where they would meet Scotts Primary School. Clockhouse now had a buzz about them, and were playing some brilliant football a one sided semi-final was dominated by Clockhouse with 3 goals coming from Gracie H, Jodie S and Sophie L.
In the final Clockhouse again met defending champions St Mary's in a game that felt like deja vu. Clockhouse pushed on looking for a winning goal but at the end of normal time the scores remained goalless, meaning the competition would be settled by penalties. Clockhouse had lost in the borough cup semi-final on penalties already this year and the nerves were clear to see. But this group of determined girls fought back the nerves. In a best of 3 penalty shoot out Gracie H, Jodie S and Sophie L stepped up. After both teams had taken their 3 penalties the two sides still could not be separated. So we went to sudden death. Kayleigh M who had been unbeatable in goal all day made a strong save from the St Mary's penalty taker. This left Paris K with the opportunity to win the competition for Clockhouse. With a powerful strike she found the back of the net making Clockhouse winners of the Linda Galloway Cup for the first time in our history. After the game Mr Yarrow said 'Wow!!! We always put on a show, we never take the easy way to a championship. Some of these girls got back late yesterday evening from Bournemouth but yet they still got to the tournament and gave it everything they had. A lot of praise will go to our hard working midfielders Paris K, Gracie H and Sophie L and rightly so. But I would like to say a massive well done to Attiya R and captain Rosie K in defence along with the passionate Kayleigh M who helped ensure Clockhouse did not concede a single goal throughout the tournament. Kayleigh's 2 penalty saves were the icing on the cake! Thank you to all the children and parents who gave up their Saturday's to be a part of the success. Thank you to Mrs Savidge who supported from first kick to last, and most importantly thank you to Mr McGlinchey for giving up so much of his time to help the girls get to where they are now. Girls Football has not stopped progressing over the past 5 years, without Mr McGlinchey we would not be where we are today. We never had the privilege of knowing Linda Galloway, but today she would of been proud of all the football played not only by Clockhouse but by all the schools. We have the honour of hosting the tournament next year where I am hoping we can put on a great show in Linda's memory! SQUAD - Rosie K (c), Kayleigh M, Gracie H, Beth C, Jodie S, Attiya R, Rameen S, Paris K, & Sophie L.